Diddy runs the city. Allegedly Diddy also throws chairs. If there’s one you know about me it’s that I think there is nothing better than “boom cat, boom boom cat” from MTV’s Making the Band. 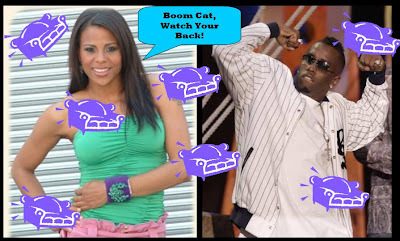 What a real Monday treat it was for me when I read that “boom cat, boom boom cat” (choreographer Laurie Ann Gibson) has allegedly filed a complaint against Diddy for throwing a chair at her during the filming of the new Making the Band season. Diddy, of course, is saying that this claim is false and that this is just another example of people trying to take advantage of his fame. Someone on the NYPD has verified that the complaint had been made, but that no criminal activity had been found. Uh, if this took place during the filming, couldn’t they just check the tape and see if it had, in fact, happened? Although, who hasn’t had a chair thrown at them once or twice? Laurie Ann could have done totally taught the chair to boom cat, boom boom cat.